Novi, Michigan- June, 1999............ Unlimited Air Racing Champion, Lyle Shelton, was among those motorsports notables inducted into the prestigious Motorsports Hall Of Fame this past week at black tie ceremonies held at The State Theater in downtown Detroit. Shelton was one of ten inductees for this year. The others included Indy car racer, Jimmy Bryan; NASCAR driver, Tim Flock; the multi-talented SCCA, Trans-Am, Can-Am, lndy and Formula I driver, George Follmer; NHRA notable, C. J. "Pappy" Hart; lndy car designer and builder, Frank Kurtis; old-time Indy driver, Frank Lockhart; Grand National Motorcycle Champion, Bart Markel; racing engine legend, Harry Miller; and boat racer, Bill Seebold. The Motorsports Hall Of Fame in Novi, Michigan has inducted, over the past eleven years, a sparkling array of motorsports champions from all of the motorsports disciplines. Names like Richard Petty, A.J. Foyt, Don Garlitz, Phil Hill, Barney Oldfield, Shirley Muldowney, Mark Donahue, Jim Clark, Mario Andretti, Al Unser, Junior Johnson, Dan Gurney, Parnelli Jones, Bobby Allison, David Pearson, Ted Horn, Bobby Unser, Roger Ward, Roger Penske, Rex Mays, Malcolm Campbell, Johnny Rutherford, Mauri Rose, Peter Revson, Lee Petty, Henry Ford, Ned Jarrett, Tony Bettenhausen, Rick Mears, Buck Baker and many others are typical of the caliber of competitor enshrined in this Hall Of Fame. Consequently, induction is no small thing but Shelton's records more than place him among this pantheon of greats. Since 1968 Lyle Shelton has won more Unlimited Air Racing Championships than any other pilot in the class. He has repeatedly broken qualifying and race records. In addition he has had many second and third place podium finishes. Shelton was also the National Point Champion in the Unlimited class or air racing in 1971, 1973, 1975, 1988, 1990 and 1991. This marvelous competitor set a time to climb record in 1972 that still stands today. He went from a standing start to 10,000 ft. in 91.9 seconds. On August 21, 1989 Lyle, who is sponsored by Aeroshell 15W-50 Aviation Oil, set the Worlds Absolute Propeller-Driven speed record over a three kilometer course at Las Vegas, New Mexico at 528.329 miles per hour. A record which rivals early jet speeds and on that will be extremely difficult for anyone to beat. 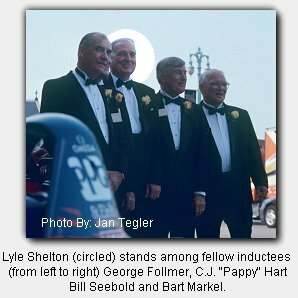 Lyle Shelton is now enshrined in The Motorsports Hall Of Fame in the Air Racing category with other famous names such as Jimmy Doolittle, Glenn Curtiss, Roscoe Turner, Jacqueline Cochran, Bill Falck, Darryl Greenamyer, Steve Wittman and others. The entire Eleventh Annual Induction Ceremonies were covered and will be shown on cable television's Speedvision channel. Story, Courtesy of: John Tegler- Wings Publishing & Production Co.
copyright ©1997-98-99 Airport Fence Productions, Inc.